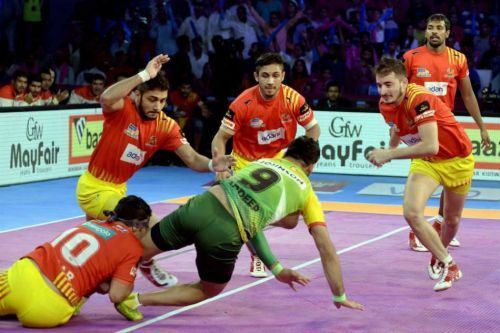 Finalists from last season, the Gujarat Fortunegiants will hope to get their season off to a bright start when they face off against a new look Dabang Delhi unit for match number five of the Pro Kabaddi League season six at the Jawaharlal Nehru Indoor Stadium in Chennai. Ahead of the auctions, the Fortunegiants opted to retain the services of their star defender from last season, Sunil Kumar, who will be leading the side which boasts of a lot of youth in their ranks. K Prapanjan, Mahendra Ganesh Rajput and Sachin Tanwar will form a major chunk of the raiding department and the onus will be on the trio to lead the way. Sachin Vittala and Ruturaj Koravi, who were bought for big sums of money have been pipped to enjoy a great run and their alliance with Sunil Kumar will be of paramount importance against a good looking Dabang Delhi side, which will be led by Joginder Narwal. Narwal will have the mighty presence of Ravinder Pahal on the right corner while all-rounders Meraj Sheykh and Rajesh Narwal will have a huge role to play in the opening game. The likes of Shabeer Bapu, Pawan Kumar Kadian, and especially Chandran Ranjith, whose services were procured for a whopping sum of 61.25 lakh rupees will hope to be at their best against a well-knit Gujarat defense setup. With the season already producing some thrilling moments, this battle could well go down to the wire with two evenly matched teams set to take to the mat. Both the teams look different from the composition they had last season and while the Fortunegiants have roped in a fresh set of legs, Dabang Delhi will hope to see a change in fortunes in the upcoming season with a wealth of experience in the squad. The Gujarat Fortunegiants looked solid in their path to the finals last season and under newly appointed skipper Sunil Kumar, the Fortunegiants could be expected to put up a stern fight. However, the biggest plus for Dabang Delhi will undoubtedly be the experience in the squad interlaced with an exciting mix of youngsters that could ultimately see the Joginder Narwal-led side come out on top at the end. Dabang Delhi to win over Gujarat Fortunegiants.